JT IRREGULARS: "WiGWAG: Trump and McDonald's, 'Mueller Time,' and more"
"WiGWAG: Trump and McDonald's, 'Mueller Time,' and more"
Donald Trump so loves McDonald’s he even ordered the White House kitchen staff to recreate the fast-food chain’s fried apple pie and Quarter Pounder with cheese — minus the pickle and with extra ketchup, according to a Politico report. 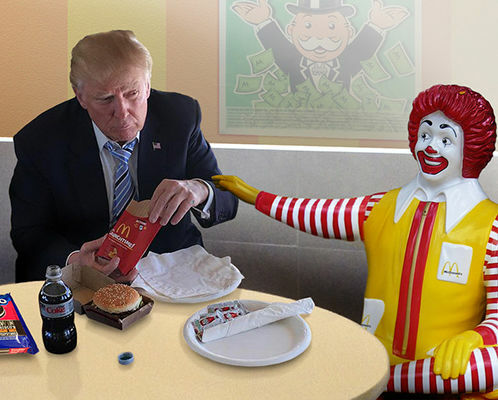 But apparently ingredients at the White House are too high-grade and the chef couldn’t satisfy Trump’s tastes — and so a senior staffer found himself at the Golden Arches. Pity the poor driver when the president downloads UberEATS to his phone. A woman wrote to ask Pat Robertson — the ethically challenged preacher and host of CBN’s The 700 Club — why God allowed her 15-year-old son to die. Robertson had an answer for God at the ready: God let her son die to prevent him from becoming an alcoholic or atheist later in life. Robertson previously described the Las Vegas massacre as God’s retribution for America’s disrespect of Donald Trump. A gynecologist in Altoona, Pennsylvania, says she was inundated with calls from men trying to schedule appointments with her office. The calls came after media publicized that OB-GYNs were able to prescribe medical marijuana. Pennsylvania’s medical marijuana law, passed in 2016, provides for prescriptions for patients dealing with 17 qualifying conditions. Male menopause is not one of them. After years of an ongoing political feud, a neighbor of U.S. Sen. Rand Paul just couldn’t take it any more. Rene Albert Boucher, 59, attacked Paul from behind as he was mowing his lawn in Bowling Green, Kentucky, forcing the senator to the ground and fracturing five of the his ribs. Paul is a Republican, Boucher is a registered Democrat. Boucher’s been charged with fourth-degree assault with a minor injury, a misdemeanor. An 81-year-old resident of Bretten, Germany, alerted police after he came across an “object, which really did look very like a bomb,” according to a statement from local law enforcement. The object was about 16 inches in length, weighed 11 pounds and was found in a garden. Any guesses? Yep, it was a rather large zucchini. Activists are crying foul over a restaurant’s use of pre-op images of Bruce Jenner from the Olympics on the door of its men’s room and Caitlyn Jenner’s famous Vanity Fair cover on the women’s room. Dodie’s Place Cajun Bar & Grill in Allen, Texas, shared photos of its weekly specials and new bathroom doors in a Facebook post that went viral. A new study published in the journal Translational Issues in Psychological Science says Donald Trump stands out among other politicians as being exceptionally low in analytic thinking. Processing speeches, debates and written documents in intelligent text analysis software, the researchers identified where Trump falls on the analytic-narrative continuum. He scored a 23.8 to Ben Carson’s 39.1, Marco Rubio’s 48.7, John Kasich’s 48.9 and Ted Cruz’s 62.1. The conclusion: The analytically minded see Trump as superficial and uninformed but his supporters see him as straightforward and relatable. The Greater Columbus Convention Center has turned a popular cultural practice into a dramatic piece of art. Visitors to the Ohio center provide their faces to create — and recreate — “As We Are,” a 14-foot-high “interactive sculpture” shaped like a human head. Step into a 3-D photo booth, and next see your face become the sculpture’s face, thanks to the head’s custom-built, 850,000 LED display screens. A phone selfie will never be the same. A White House photographer caught D.C. bicyclist Juli Briskman flipping off Donald Trump with her middle finger as the president’s caravan carted him to his golf course in Sterling, Virginia. The picture went viral immediately, with the hashtag #Her2020. But it also caught the attention of her employer, White House contractor Akima, LLC. While the masses declared Briskman a “she-ro,” her boss declared her fired. Every time Special Counsel Robert Mueller indicts an associate of President Donald Trump, the Bird DC — a bar in the U.S. capital — will offer a special $5 “Moscow Mueller” cocktail. The drink is the restaurant’s variation of the Moscow Mule, made with vodka, ginger beer and lime juice. Earlier this year, the Bird announced $4 happy hour drinks on days when Trump fired a White House staffer.